L will be one in exactly one week. I will have three children in one week. I was kind of ok with the two children and one baby by 30 thing, but the three walking, talking, cheerio-eating children by 31 seems, well, a bit fundamentalist or hookerish or something. Fast and loose. Yep, that's me*. Needless to say, I am freaking out and mourning the loss of my precious wittle angelbutt who is now almost one, going on 12. The child, she has the "sass" bit down. Oh, did I mention that she also has perfected the art of the temper tantrum? Refined is more like the word. 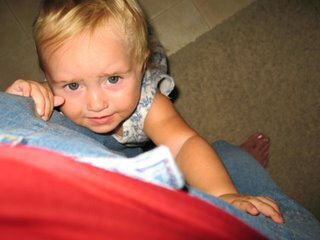 She knows that there is this spot in between my legs where I can't reach her well enough to pick her up, so she clings to that spot and whines and screams and bites and I am thinking it is almost time to trade her in on a new model. This one is making a racket. Attractive quality in woman, no? I am never going to get her married off. *Fast and loose are probably the only two things I am not. Fertile? As the Tennessee valley, but not so much with the loose. So don't go getting any ideas. I am so not going to make out with you.